Flipping is a term in real estate used to define the purchase of a piece of real property and reselling it fairly quickly for a profit. The profit occurs from selling a property while the market is appreciating, and/or improving a property purchased under market value, and then selling it above market value. What are the Risks of Flipping? The risks of flipping houses in NY are straightforward. Will markets continue to appreciate as anticipated? Do the actual improvement costs match what was budgeted? Will the property sell within a reasonable amount of time? GeoData Plus tracks flipped sales by flagging properties when they sell more than once in a one year period. 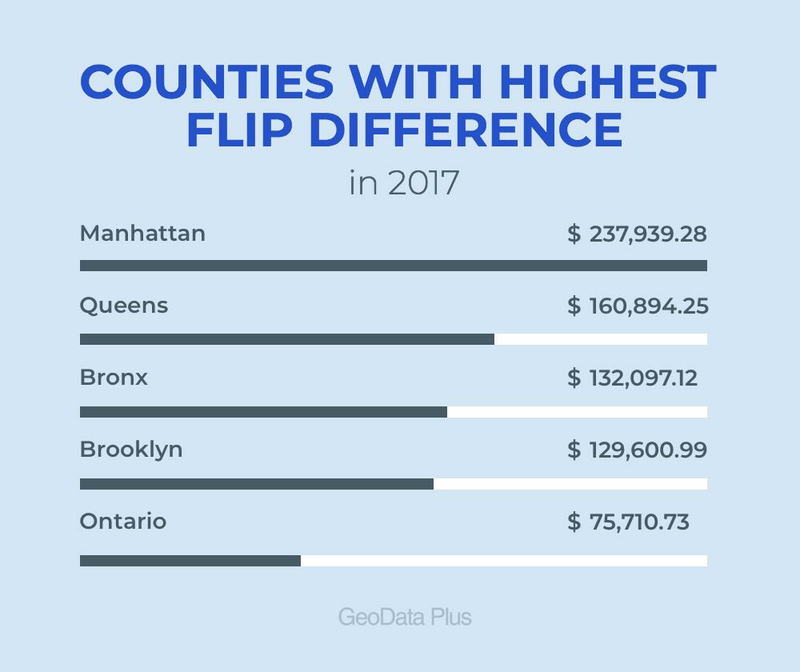 In a recent study, we put property flips under the microscope in New York State to determine the average profitability of a flip per county, as well as other interesting metrics. The study used property sale data for all of 2017. While some of the findings aren’t much of a surprise, other pieces of information might surprise you. 4 out 5 of the Boroughs are in the top 5 for the greatest profit on a flipped sale in 2017. Number one is Manhattan, with a difference of $237,939 per flipped property. Ontario and Nassau County took 5th and 6th place, followed by Staten Island. Orange County had the highest percentage of flipped properties, being the only county where over 1.5% of all properties were flipped in 2017. That’s over 1 of every 75 properties flipped in Orange County. Interestingly enough, Orange County also is in dead last as far as profit per flipped sale, with an average loss of just over $35,000 per flipped sale transaction. Keep in mind this is once again, just the difference between when the property was first bought, compared to its subsequent sale. It doesn't consider the amount of money put into the property buy the flipper through financing and/or improvements, which would of course reduce that number further. Is There a Correlation Between the Number of Flips and the Profitability per Flipped Transaction? Apparently not. Tompkins County had the lowest percentage of flipped properties, with less than 150 flipped transactions in 2017, which is less than .4% of all properties - with a an average loss of $2162 per flip. 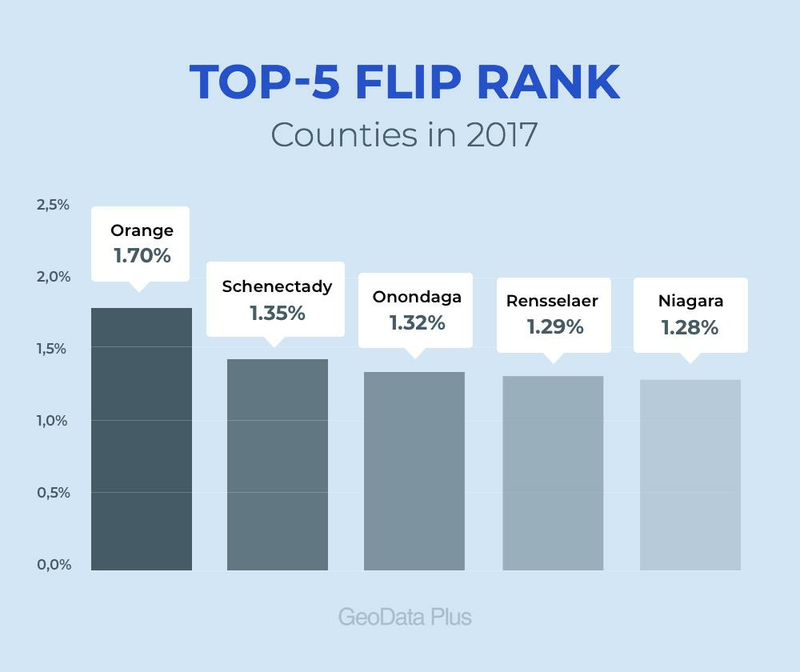 When it comes to quality and quantity, there are 5 counties where over 1% of all properties experienced a flip transaction in 2017, and the average gaon on a flipped sale transaction was greater than $15,000: Those were Ontario, Albany, Niagara, Monroe, and Onondaga. What Else Does GeoData Plus do? In addition to tracking flipped property sales, GeoData Plus does a lot more. We have compiled a database with information on every residential and commercial property in the United States. It includes ownership, building and lot details, zoning, flood zone, sales/mortgage history, telephone numbers, foreclosures, and listings. In addition to that, we have a sales comparables tool that is trusted by thousands of valuation professionals to accurately determine the market value of a property. Last but not least, GeoData Plus provides nationwide property data with a foreclosure database consisting of pre-foreclosures and auctions.